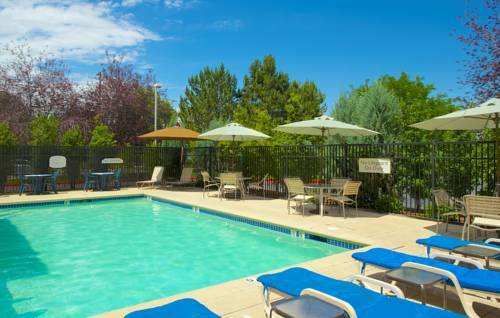 Break away from the ordinary stay at our hotel in Boise, ID SpringHill Suites Boise ParkCenter. As one of the premier all-suite hotels in Boise, Idaho, we invite you to savor the perfect balance of comfort, style and convenience. In addition to our free airport shuttle, we offer easy access to Downtown Boise as well as Boise River Greenbelt, Boise State University and Bronco Stadium. After a busy day or week, make yourself at home in contemporary-inspired suites featuring separate spaces to work, relax and dream. With spacious desks, free Wi-Fi, mini-refrigerators, microwaves and luxurious bedding, you can stay as productive or relaxed as you please. In the morning, start your day satisfied with a complimentary hot breakfast buffet served daily, or work up a sweat in our state-of-the-art fitness center. When it's time to enjoy the outdoors, soak up the sun at our sparkling pool, or take advantage of our on-site bike rentals to get some exercise while enjoying our city's great scenery.